This property is 9 minutes walk from the beach. 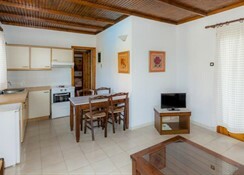 The 4-star Corfu Residence is a 5-minute walk from Nissaki Beach. 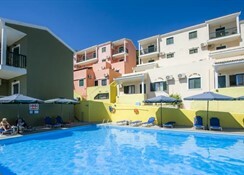 Facilities include swimming pool with pool bar, sun loungers and parasols. There is also a cocktail lounge and buffet restaurant on site. Some have a fully equipped kitchen with fridge. All units are air-conditioned with a TV and direct dial telephone. The restaurant serves varied breakfast and dinner buffets, with a focus on Greek cuisine. Refreshing drinks and ice creams can be enjoyed at the poolside bar or at the inviting hotel lobby. Guests can enjoy beautiful panoramic views of the sea while taking a dip in the hotel’s outdoor swimming pool or drinking a drink at the pool bar. Free Wi-Fi access is provided in the reception area. Corfu Residence lies on the north-eastern part of Corfu, 23.5 km from Corfu Town. Free private parking is available on site. 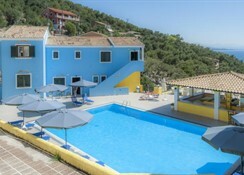 First time Corfu, we really enjoyed the corfu residence, staff were friendly and helpful. The accommodation was very nice, nice swimming pool and bar. Average at best, only booked this place due to its '5* Tripadvisor rating' which i now realise is bogus, i suspect Tripadvisor are paid to give incorrect ratings. This place was a typical company establishment, not family-run, certainly not independent.